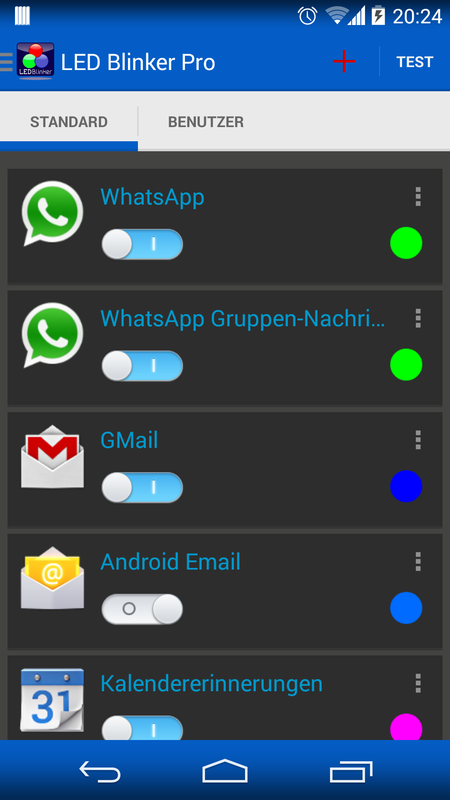 Let LED Blinker Notifications (formerly LEDBlinker) show your missed calls, SMS, Facebook and Whatsapp messages. If you have no hardware led, the screen is used. All apps are supported in the full version, click on the plus button on the top and add the missing. 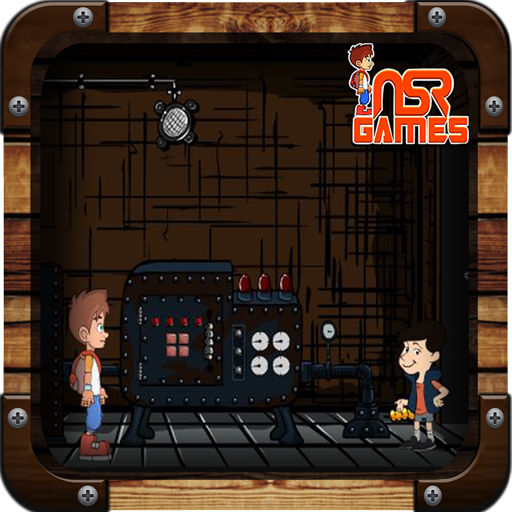 Facebook Page http://goo.gl/I7CvM Google+ Community http://goo.gl/5XBdN This app is very simple to use and not much configuration is needed! 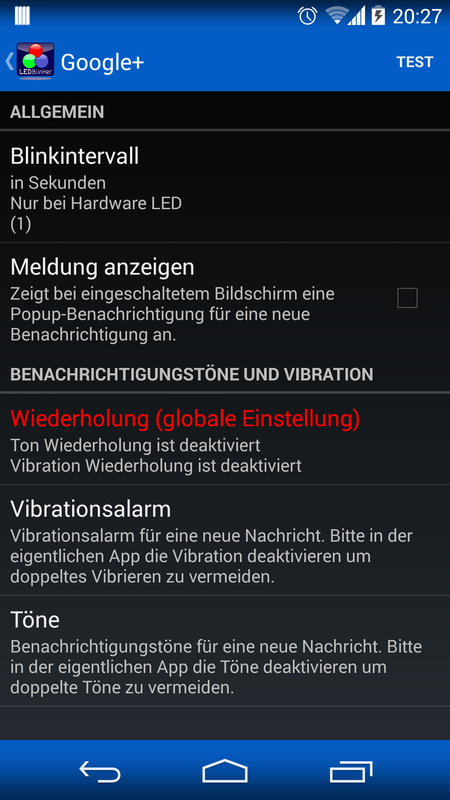 Functions: Ã”Â£Ã¶ Works with latest Android Lollipop Version Ã”Â£Ã¶ individual settings for each app, e. g. blink rate, vibration, sounds and repeats Ã”Â£Ã¶ light and dark color scheme Ã”Â£Ã¶ export/import settings (no lost settings when you install new ROMS/mods) Ã”Â£Ã¶ Silent mode for every day (enable it for the night to stop blinking Ã”Â£Ã¶ widget to deactivate LED Blinker/remove notifications quickly Ã”Â£Ã¶ Screen LED for phones without real LED Examples for apps with notifications: Ã”Â£Ã¶ missed calls and sms Ã”Â£Ã¶ Battery status (LED notification for low battery, < 10%) Ã”Â£Ã¶ Google Mail Ã”Â£Ã¶ Google Talk/Google Hangouts Ã”Â£Ã¶ Calendar reminder notifications Ã”Â£Ã¶ Standard EMail App Ã”Â£Ã¶ SNOView - Social Network Overview notification Ã”Â£Ã¶ Facebook messages Ã”Â£Ã¶ WhatsApp messages Ã”Â£Ã¶ Skype messages Ã”Â£Ã¶ Bluetooth messages (LED goes on when bluetooth is active) Ã”Â£Ã¶ Alternative On-Screen-LED Ã”Â£Ã¶ Twitter, Threema (now with group support), Facebook Messenger and so on. 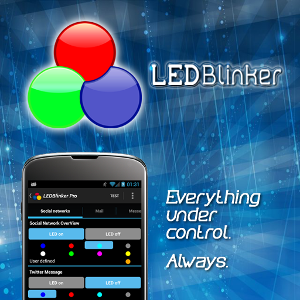 * AndroidHeadLines: 'LED Blinker is an Android app that aims to make it much easier to help you figure out which notification is which'. 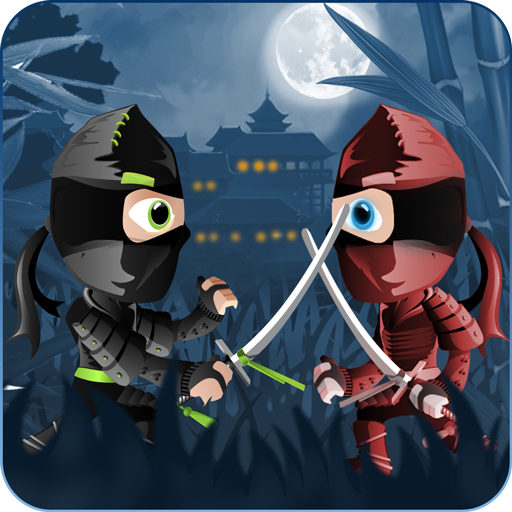 http://androidheadlines.com/2014/12/sponsored-app-review-led-blinker-notifications.html Unlike other apps in this category you don't need 'ROOT' access to use LED Blinker and this app is very battery friendly! All rights are needed to run the app, lesser are not possible. The new right to write to SD card it needed for error reports (check menu extras: Debug mode), please send it to mosoft.android@gmail.com if you have found an error. 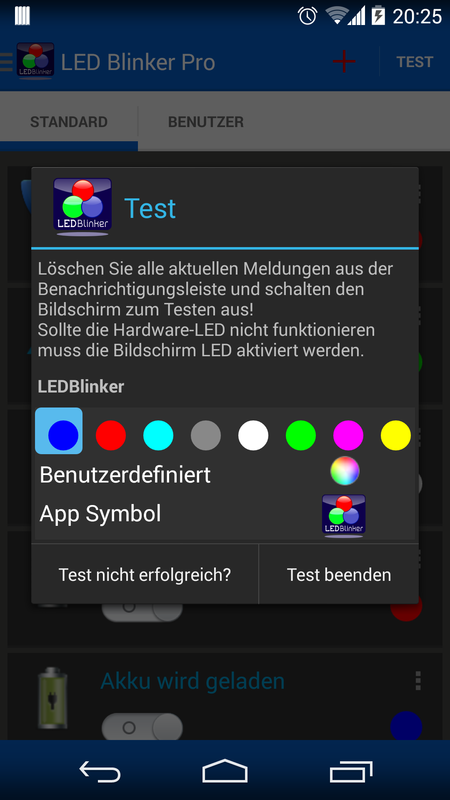 Please try out the lite version at first to see if your hardware LED works (on screen LED is always working!). LEDBlinker Notifications has no internet permission, your data is safe!!! Please check device specific hints at the end! Fast support is very important for me! (Look at the ratings, thanks to all people!) If you have problems please do a full re-install and/or reboot your phone. Otherwise contact me at Facebook/Google+/Email to get help. Warning: If your phone speaks after install (Samsung S4, S3, S3 Mini, S2, Note1, Note2, Note3, LG Nexus 4) you have to disable Samsung TTS (text-to-speech) under settings -> apps manager -> all (on the right) and Google TTS (text-to-speech). Only needed when you use the accessiblity service! 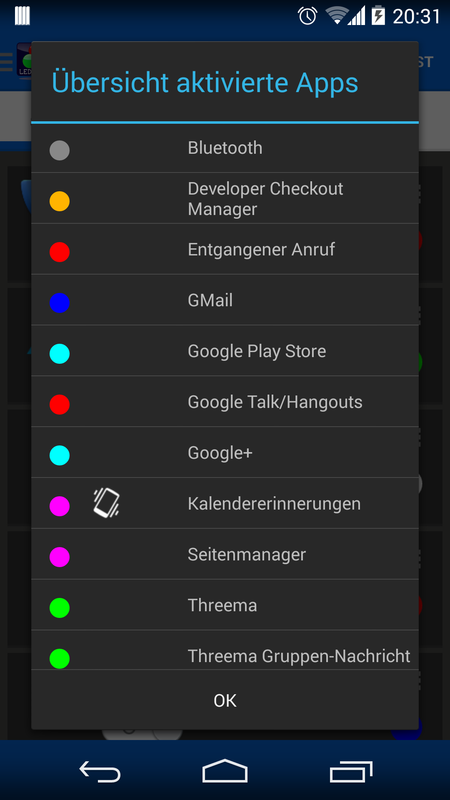 Another solution to fix talkback issue: You can change the launcher by using another one from the Google Play Store. For example, Solo Launcher - Swift & Smart, Nova Launcher, Go Launcher and Holo Launcher. These launchers will not exhibit this bug. For Samsung S4 users: If your phone speaks when opening your browser you have to use another browser like Chrome or Firefox. Hint HTC users: Your phone is NOT supported, you have to use the on screen led! Sony Phones: Please disable stamina mode in your device settings. Let your led glow with different colors!